Looking at a topographical map we can sometimes deduce what might be a good flat-water paddling stream. Sometimes we’re flat-out wrong. A stream that’s crossed by topo lines gets vetoed – likely to be white-water. A stream that’s narrow and convoluted like a squirming worm also gets voted out – likely to have blow downs and log jams. So we pick a stream that passes these tests and launch our kayak or canoe, hoping for the best. 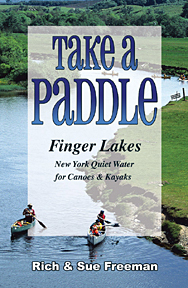 That’s what we did in researching our two new “Take a Paddle” books. Most times it worked out well but every once in a while it didn’t. The most memorable of those was on Tonawanda Creek. I launched near Attica and paddled north 5 miles to the next bridge. I had to portage once around a log jam but within an hour I had covered the distance and traded the kayak to Rich. He continued north on Tonawanda Creek while I shuttled the van to the next bridge, 5 miles upstream. We each had walkie talkies to stay in contact. We had gotten them earlier in our research when I sat at the designated meeting point along the Tioughnioga River waiting for Rich to come downstream. Unbeknownst to both of us, where I sat was along the shore of a large island. Rich picked the far channel to paddle and glided downstream undetected. As darkness fell we both realized something had gone wrong – but what? Eventually, in pitch darkness, Rich hauled out to a nearby road and I canvassed the roads along shore and finally found a glimpse of a paddle. We reconnected, wet, tired and hungry but relieved. A better communication system was a must. But, back to Tonawanda Creek. Again, I sat along shore, expecting Rich to glide by in about an hour. After 2 hours Rich didn’t appear and he wasn’t answering his walkie talkie. So, I drove in circles around the creek, repeatedly calling – still no answer. I knew I was in range at some point so again, what was wrong? Was Rich unconscious somewhere or pinned under a strainer? Or were the batteries in his walkie talkie just dead? After 4 hours I was panicky so I went to a nearby house to ask the people if I could use their phone to call 911. They calmed me down and told me that the stretch Rich was paddling was choked with log jams and that people often stumbled out exhausted wanting to use their phone. They talked me into waiting one more hour. So, I returned to my post along shore, thinking all sorts of horrible thoughts. Three minutes before the fifth hour was up, an exhausted, mud-covered Rich stumbled out of the woods without his kayak. He had endured a never-ending series of portages up and down steep mud banks to get around log jams. And, his walkie talkie batteries had died. He led me back into the woods to retrieve his kayak, poised below another log jam. I dragged it out to the road, we heaved it onto the van, and vowed to pay more attention to the power levels in our walkie talkie batteries. And, to never paddle Tonawanda Creek between Attica and Batavia. Moral of the story: get copies of the “Take a Paddle” books and you’ll know what you’re getting into before heading downstream. And, no, Tonawanda Creek between Attica and Batavia will not be found in either book. I haven’t seen our resident Great Horned Owl in some time now. I hear her once in a while, sometimes after taking the dogs out prior to sunrise. Or the crows let us know she’s about with their harassing cacophony. Being Great Horned owls are among the first to nest, even as early as late January, maybe she’s tending a clutch of eggs – or preparing to. The last time I actually saw her was while canoeing with my grandson Sam. We heard the crows long before we saw the owl. The crows finally quieted down and we continued paddling upstream. That’s when my grandson got his first look at the awesome sight of a Great Horned Owl up close and on the wing. The owl had roosted in a black willow on the creek bank. She took flight as we drew near, willing to take her chances with the crows. It might at first seem like a bad choice on her part, but perhaps she had good reason. Maybe she remembered me as one of the guys who tried to swipe her meal. A late summer canoeing-fishing trip a couple years back resulted in one of those wildlife dramas that occur only when no one thinks to bring a camera. Two days earlier I had hooked and lost a sizeable northern pike. At the time I was on the Tonawanda, about two hundred yards upstream from our home. The following Monday, John Lawrence and I returned in an attempt to relocate the big fish. “Where?” I asked, looking into the trees. Along the east bank, right at the water’s edge, a mature Great Horned Owl was straddling a very-much alive hen mallard. One of the duck’s wings was swept back at an odd angle, obviously broken (actually, “mangled” would be a better word) during the owl’s attack. Judging from the owl’s size, about 26 inches tall, it was probably a female. “Let’s get closer,” said I. We paddled in for a closer look. John, seated in the business end of the canoe, didn’t mind. He was in the bow, scant feet from a very intense-looking bird of prey with piercing eyes. Glowering at us, the owl stood its ground, not willing to give up the duck. A notoriously nocturnal bird of prey, she pounced on that mallard at 4 pm. The fact that she hunted with the sun high in the sky came as no surprise. Besides being lethal birds of prey, Great Horned Owls are creatures of opportunity. I was still in my teens when I became intrigued with the Great Horned Owl. My first encounter was at extremely close range, and awe-inspiring to say the least. It was late spring and I was hiking a clear-cut that would lead to the Hawley farm where I might find a woodchuck or two. There were woodlots on both sides of the clear-cut and from the woods to the east came the sound of crows, both numerous and frenzied. Though not far away, I couldn’t see them as the foliage was dense – both the woodland canopy and its understory. Moments later – and with no warning whatsoever – this larger than life feathered critter with an incredible wing span exited the woods directly in front of me. Momentarily stunned, I literally stopped in my tracks. Seeing me as it cleared the wood line, the owl banked sharply to the right and kept flying along the clear-cut. It took a few moments before I realized what I had seen. I knew it was a bird of prey, I just wasn’t exactly sure of the species. I knew it wasn’t a hawk as it had a big round head. And there was something else strange, something I couldn’t quite put my finger on – at least not right away. Once realizing I had my first encounter with a mature Great Horned Owl, I set about to do some homework. Not long afterward I learned just what it was about the owl that made the moment a bit surreal. Despite its size, it hadn’t made any noise at all. Even though passing by within spitting distance, the owl flew in total silence. Its feathers are made for silent flight. That’s how it hunts, like a stealth fighter of the woodlands. There is no “swooshing” sound as air passes through its feathers. The sight of the Great Horned Owl emerging from the woods with no warning and passing so closely is etched in my mind. Up until that moment I was under the impression all owls were the size of the “wise” bird pictured on a bag of potato chips. I also learned that crows and owls have an intense dislike of one another. Having gotten my attention that day long ago, I find the Great Horned Owl both fascinating and lethal. Through the years I have been made aware of just how deadly they are. I’ve heard some great owl stories from folks who have spent considerable time in the wilds. Author and naturalist, the late Jack Denton Scott once documented a Great Horned Owl attack on a human. “The man should have known better,” Scott said of the ranger that was attacked. “But there is a lot of boy in man, and the ranger was wearing a muskrat fur cap while making his late afternoon rounds in the wilds of northern Minnesota. He never heard a sound until the fury fell upon him.” The owl apparently targeted the muskrat cap thinking it was something to eat – or maybe not. Mother Nature is not without mistakes, nor does she always play by the rules. The ranger did not survive the attack. Jim Joyner of Alabama, NY is an avid outdoorsman who spends a good deal of the year hunting, fishing and canoeing near his cabin in the southern tier. A while back Jim had an experience similar to the aforementioned ranger. Seated in his tree stand while bow hunting, a Great Horned Owl flew in without warning and knocked Jim’s hat off. Jim was fortunate in that the owl’s talons latched onto his hat alone. Going off the beaten path isn’t always necessary to encounter a Great Horned Owl. All that’s needed is a food supply – and a city-dwelling owl has no problem locating items to feed on. Squirrel’s, domesticated animals such as cats, and barnyard fowl, like baby ducks have all found their way on the horned owl’s menu. A few years ago a friend of mine attempted to raise ducklings in his back yard. One morning he noticed one or two ducks were missing. A few mornings later more baby ducks were gone. My friend had no idea what could be preying on the ducks as he heard no commotion during the night. His first thoughts were a neighbor’s cat or maybe a marauding raccoon were responsible. After another raid on his ducks my friend spent the evening in his backyard covered with a sheet. Later that night a Great Horned Owl failed in its attempt at a fourth duck dinner. Fish and Wildlife experts are gearing up for an all out assault on Tonawanda Creek this weekend, where experts hope to wipe out water chestnuts before too much damage is done. The U.S. Fish & Wildlife Service discovered them a couple months ago on a routine fish survey. Why all the fuss about getting rid of them? This Sunday, U.S. Fish and Wildlife will have the help of nearly a dozen volunteers from Buffalo Niagara river keeper. They’ll use canoes and kayaks and pull the plants up by hand, the root and all. They hope to cover a 6-acre area of Tonawanda Creek. They won’t clear all the standing weeds, just the Invasive water chestnuts, but some of the park users think anything will help. These are not believed to be the edible kind of water chestnuts, and the next closest place they were found was in Chautauqua or the Montezuma swamps.